Spring flowers represent the end of dreary winter weather! 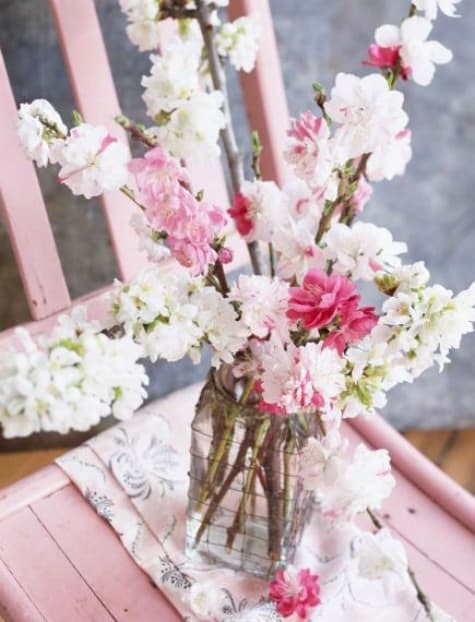 Even if it’s a bit early to be finding these blooms in your garden, many of them are readily available in grocery stores and garden centers making it easy for you to add spring cheer to your home right now. Don’t hide your teacups in the cabinet. Pull them out and fill them with beautiful tulips! If you don’t already have any pretty teacups, check local thrift stores. 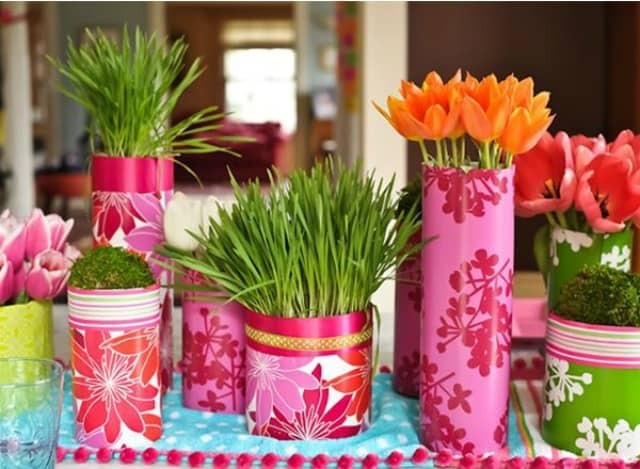 Wrap tin cans or containers from the dollar store with pretty wrapping paper and fill with spring flowers. Group them together for high impact! 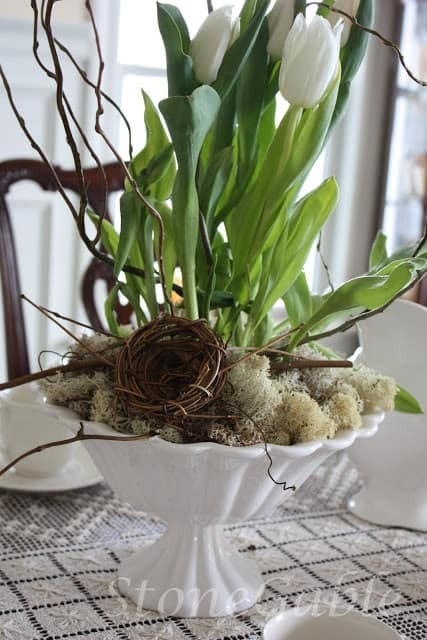 Make a lovely neutral display with white tulips displayed in a white fluted bowl with twigs, a bird’s nest and bits of reindeer moss added. A wooden tray makes a great container for corralling mini clay pots filled with individual tulips and bits of deer moss. Add a few dyed eggs and this will carry you straight through to Easter. 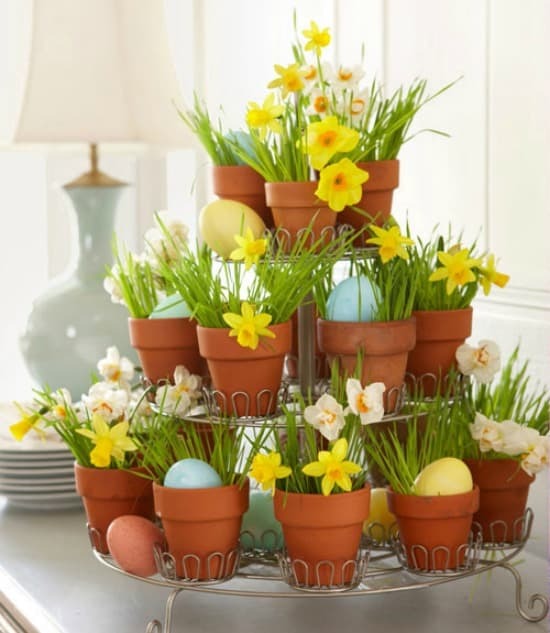 Place mini clay pots filled with daffodils and bits of grass on a tiered cupcake stand. 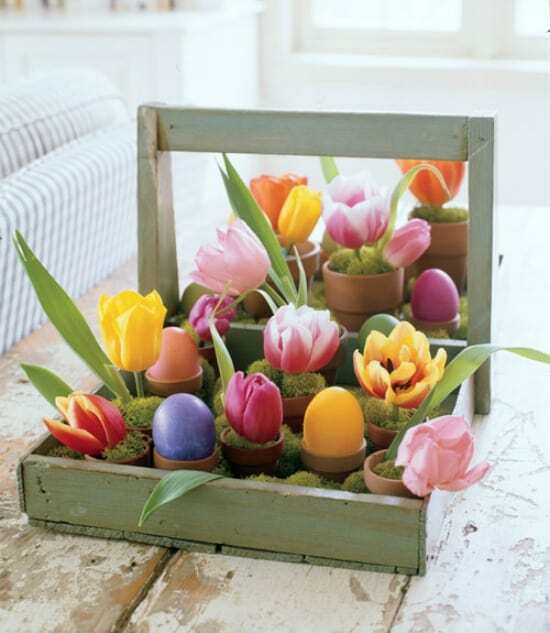 This is another idea where you can replace some of the flowers with dyed eggs to turn it into an Easter vignette. Flowering branches qualify as spring flowers too! Group several glass jars filled with crabapple blossoms together for a pretty vignette. 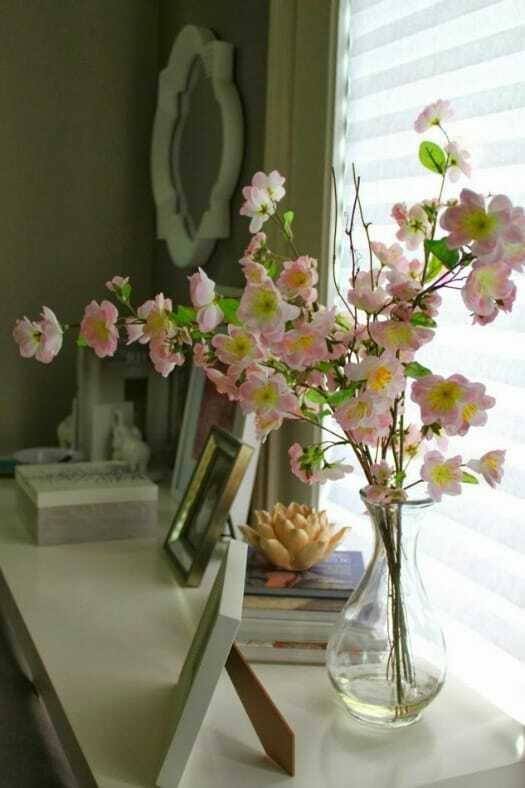 The simplicity of a single glass vase filled with faux cherry tree blossoms is beautiful and serene. 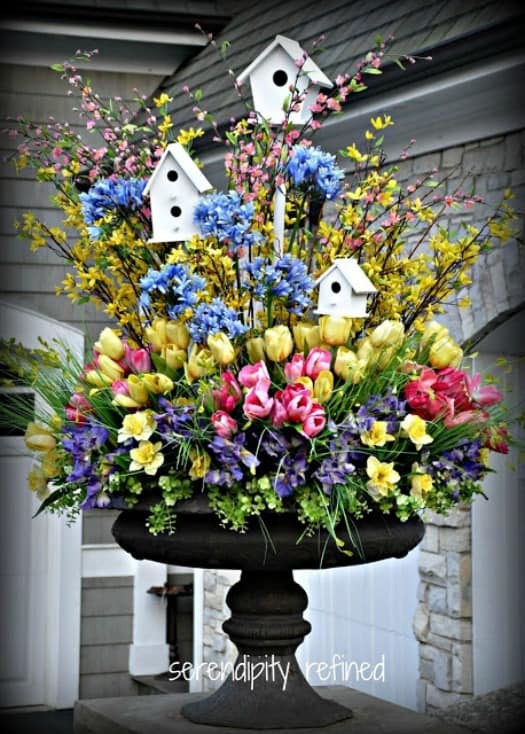 What better way to complete this roundup than with an urn filled with a stunning display of a variety of spring flowers, greenery and birdhouses! 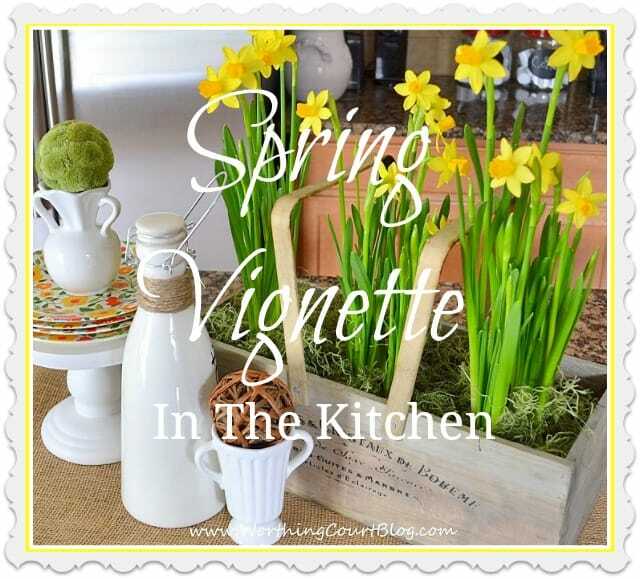 Click HERE to see a spring vignette that I recently put together using sweet daffodils from my grocery store. Have you brought any spring into your house yet? These are some great choices, Suzy. Love those flowerpots! WOW, what beautiful ideas. My favorite is the urn filled with flowers, greenery, and birdhouses…..so elegant!!! I HAVE to have flowers in my home and I try to keep at least one bouquet whenever possible. Right now I have some daffodils and they are happy, sunny little faces to me!! 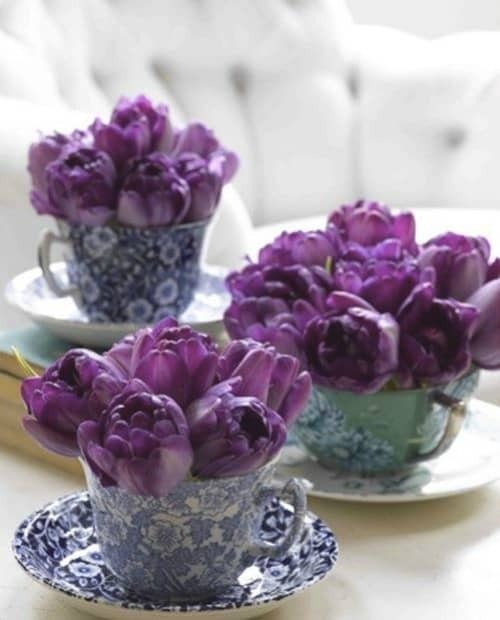 Love flowers and you posted some great examples, especially the blue and white tea cups with purple tulips. I pinned away! I bought a bouquet of flowers this week at the grocery store. And I was very tempted by some tulips in glass on sale for $4 at Food Lion. But I figured they wouldn’t last long. I love all the inspiration you found, and I love spring blooms. Isn’t it about time for the camellias to start blooming here? Beautiful flowers and ideas! Those little pots with the eggs and tulips in them at too cute! The one from Serendipity Refined is gorgeous! I’m in the spring mood- it’s just old man winter that isn’t! Oh Suzy now you have me all excited for spring. These are beautiful thank you so much!